This program creates most all the LDraw primitive types in any segment level 1/16 to 16/16, 1/48 to 48/48, and custom/custom. 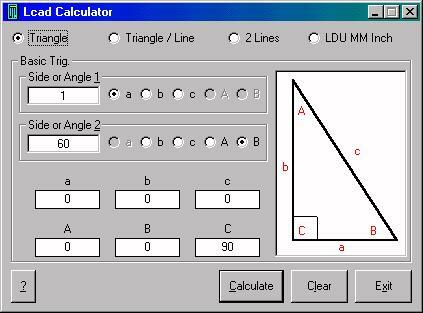 This program helps calculate the following items. Line intersections (Horizontal and Vertical lines), Triangle/Line intersection. 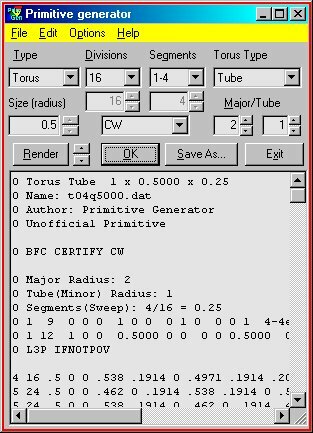 A screenshot of a part in process. 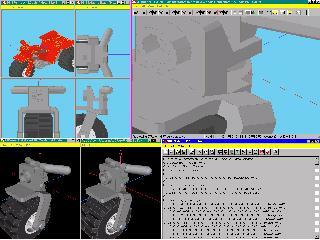 This is a screenshot working on a part. Notice all the different windows showing the same part. All the windows have "polling" turned on to automatically update as a "save" is done in the LDAO (LDraw Add On) window. Click on the picture to the left to view larger. Also see the Darth Vader helmet progrssion pictures on Brickshelf. Dat files I use while making parts. Locate with the x1 y1 z1 numbers. Here is the current dat file. If you noticed the Lego(tm) Logo on the studs. I will warn you now, It does slow rendering down in L3Lab, LDraw, LEdit, and MLcad. Since (normal)POV doesn't render lines, it ignores it, so it doesn't slow down. These parts all go into the ldraw/p directory. Please backup your original files first!!! since most people do not use them or even check stud orientation.